It didn't take Shinzo Abe long to reply to Toru Hashimoto. Reminder (see "So you want to know what is 'necessary', Mr Hashimoto? "): Osaka Mayor just claimed a spectacular warholian moment in the sick race to the most outrageous AbeIGNomics* provocation. So what did Japan's PM do this time? He posed for a photo op, all smiles and thumb up, in the pilot seat of a war plane with the number "731" painted next to the Japanese flag. 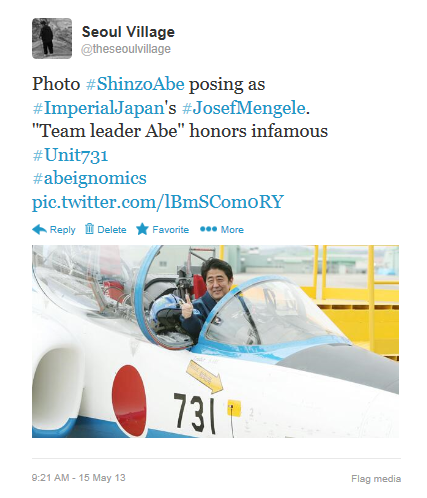 To make sure, ubi et orbi, that this number was not unintentional, it was topped by a mention in English: "Leader S. Abe". The reference to the infamous Unit 731 could hardly be clearer. That's the Harbin-based unit where the Japanese Imperial Army performed atrocious human experimentations during the 1930s and 40s. And who was the "Leader" of Unit 731? Shiro Ishii, a monster who escaped trial for war crimes by sharing his nasty secrets with the US, part of a revolting deal that not only amounted to one of the lowest moments in the history of the great American democracy, but also crippled Japan's nascent democracy, preventing the nation from facing its troubled past, and paving the way for revisionists such as Shinzo Abe. Yesterday, as Shinzo Abe all but dressed up as Shiro Ishii, the US joined China in a most vehement condemnation. In the eyes of the international community, Abe made his ultimate coming out as an all-out fascist supporting all the atrocities committed by the Imperial Japanese regime. Imagine a German Chancelor who would have previously headed a revisionist association, and who would now deny Nazi war crimes, say deportees chose to go to the camps, contest the word "invasion" to qualify the aggression of Poland, and parade as a Josef Mengele fan**. Inimaginable? Welcome to 2013 Japan. Again*, the biggest scandal is the deafening silence of Japanese citizens before the political and moral suicide of their great nation. Even the people who disagree with Abe, know about the darkest moments of Japan history, and know their nation is in great danger remain silent and do nothing. Wake up! Speak up! Stand up for Japan! Truly disturbing. It's for me very hard to give him a benefit of a doubt here and dismiss this was a mere coincidence, but there's still a small tiny chance that it was. Unfortunately he's Taiwan's only ally in the region at this moment. @MKL I'm afraid there is no chance whatsoever: Shinzo Abe likes to play with symbolic numbers, and he recently donned a jersey with #96 (he wants to alter Article 96 of the constitution). You have to be shitting me, right? This is the worst kind of third-rate tenuous link I've seen for a long time. He poses in a modern fighter jet, as have many world leaders when making these kind of appearances at air-force bases, and yet you claim, all because of the number on the plane, that he is in fact alluding to his endorsement of a unit which most Japanese deny or at least try to play down as it's a matter of national shame. Possibly the most idiotic point you make is that he has 'leader' written on the plane. Which proves what, exactly? All in all, you're trying to say Abe is trying to publicly endorse an infamous unit whose existence most Japanese nationalist deny due to shame and embarrassment. You really haven't thought about this, have you? Do you really believe that Japan has at least 730 versions of that jet in their self-defence force and that Abe just happened to sit in #731? It seems it YOU who hasn't thought about it. Q: "You really haven't thought about this, have you?" A: I have. And like most observers, I've reached the conclusion that Abe has also really thought about this. Q: "Possibly the most idiotic point you make is that he has 'leader' written on the plane. Which proves what, exactly?" Q: "This is the worst kind of third-rate tenuous link I've seen for a long time." A: Granted. You should come more often, I've got plenty of those. Q: "You have to be shitting me, right?" Deeply agree with you that the deafening silence of the Japanese public is the biggest scandal, and in fact, most disturbing. The average Japanese needs to wake out of their stupor and the wishful thinking that if they replay the delusional role play as the victim, their past will somehow realign to erase the monstrous evil they committed. Stupefying. Exactly how would Abe set something like this up? Do you suggest that he or one of his underlings called the aerobatics team and asked them to make sure that plane number 731 (one of 11) would be their lead machine when Abe visited them? I dislike the antics and politics of Abe as much as anyone else here on this blog, but this theory is just silly. Shinzo Abe is obsessed with Article 9 and you can be sure that everything is well planned when he poses in a military plane, particularly in this context. The provocation is blatant and again, even the US cried foul. He went so far he was forced to back down a bit the next day. But the whole point is that he couldn't have planned it since the plane in question has been the lead plane for the Blue Impulse for a while. Unless you think that this was planned a couple of years in advance - but this is where it gets silly. I do agree that someone should have noticed this coincidence and chosen another machine. A nazi swatiska symbol would horrify most common people in the west. Yet the equivalent symbol hardly raises a peep in Japan. Really shows where their priorities are.